In Virginia alone, there are over 900,000 men, women, and children who do not know where their next meal will come from. To fill this need, the Federation of Virginia Food banks has gathered together to provide food to pantries, kitchens, and shelters. The Foodbank of Southeastern Virginia provides food through a variety of programs like the Warehouse Distribution Program, Kids Cafe, and the BackPack program. 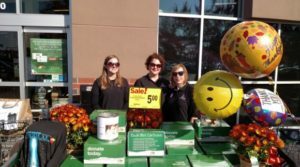 The Junior League of Hampton Roads partnered with the Peninsula Foodbank during their 20th annual Mayflower Marathon donation drive. During this event, volunteers talked to shoppers at local grocery stores about hunger in our local community, and offered ways in which they could help. Food and financial donations were collected, as well as $5 donation boxes, which contained a variety of non-perishable food items for families in need. Do you want to help reduce food insecurity on the Virginia Peninsula? Here are some tips! Stop by your local FarmFresh Supermarket and consider purchasing one of the donation boxes during your holiday shopping this year. Consider making a monetary donation to the Foodbank! Their connections and bulk purchasing can stretch your $10 into $60 worth of groceries. Organize your pantry, and take any unused food to one of the many donation centers. Use your church or organization resources to create your own food pantry in your community.